Deputy Speaker Arthur Yap and former Cabinet secretary Leoncio Evasco, Jr., perceived to be the leading gubernatorial candidates of the province, would have shared the same stage for the first time since the start of the election period to air their platforms and stand on various issues through the Bohol Chamber of Commerce and Industry’s Gubernatorial Candidates’ Forum at the University of Bohol on April 23, 2019. 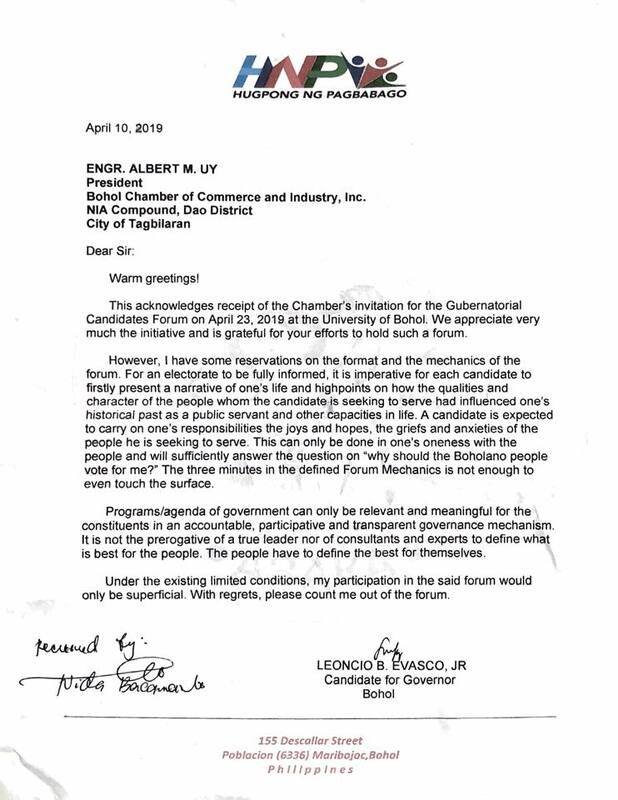 Former Cabinet secretary Leoncio Evasco, Jr. who is running for governor has decided not to join a gubernatorial candidates’ forum organized by the Bohol Chamber of Commerce and Industry (BCCI), citing “reservations” over the event’s mechanics. According to Evasco, the three-minute time allocation to answer the introductory question “why should the Boholano people vote for me” is not enough for him. “The three minutes in the defined Forum Mechanics is not enough to even touch the surface…Under the existing limited conditions, my participation in the said forum would be superficial. With regrets, please count me out of the forum,” Evasco said in a letter addressed to BCCI chairman Albert Uy. However, while Evasco lamented the “limited” time to answer the introductory question, the forum moderator will be asking other queries regarding various other topics. The forum is expected to tackle other issues covering livelihood, living condition, environment, food security, agriculture, power, water, sanitation, sewerage, tourism, information technology, investment, and transportation and traffic. Evasco expressed appreciation for the BCCI for organizing the activity but raised several other concerns regarding the forum. The BCCI initiated the series of fora joined by candidates for Bohol’s top government posts for the electorate to be guided on who to vote for. BCCI has yet to issue a statement whether or not the gubernatorial candidates’ forum will still push through even without Evasco. 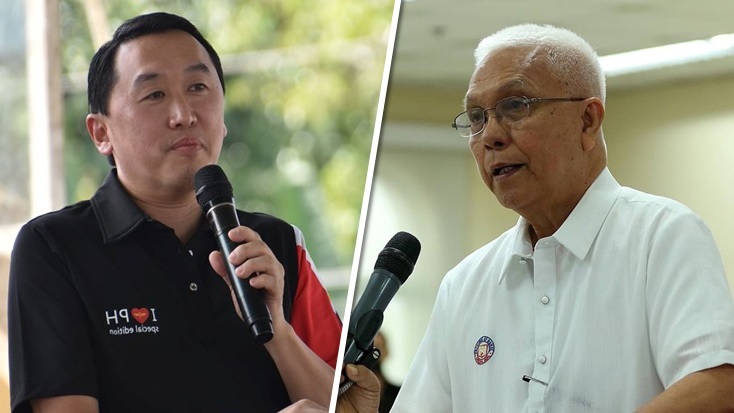 Deputy Speaker Arthur Yap, perceived to be Evasco’s top rival in the gubernatorial election, has confirmed his attendance during the forum which will be held at the University of Bohol on April 23. On Monday afternoon, three of four candidates for the Third District congressional seat participated in the BCCI-organized forum. The candidates present were Vice Governor Dionisio Balite, retired judge Caloy Fernando and Board Member Alexie Tutor.